If there are any "Second Hand Rose's" out there thinking of moving to France... hurry up! You will love it. There is nothing that the French like more than a good rummage in someone else's second hand cast off goods, and they have evolved a million and one different ways to enjoy this pass time. From priceless antiques to cheap and cheerful Brocante, there is a second hand scene in France to suit all tastes and pockets. Let's begin with a brief look at one of the best known French words commonly used in the English Language, antique. Literally translated, its meaning is given as ancient or antiquated. The word used by the French, however, is antiquités... and when we speak of antiquités in France we are usually referring to valuable old goods, furniture, ornaments, silver... so second hand objects but objects with an intrinsic historic value. Sales of antiques are often held as auctions in France, but there are specialised shops and dealers many of whom now trade through the modern medium of the Internet. In general, antiques in France, as in all parts of the world, are more expensive and specialised than the other types of second hand goods you will come across. All over France you will find signs reading "Brocante", and frequently the doors will be open offering a tantalising glimpse of... well, Brocante. Bric a Brac. Most Brocante emporiums are Aladdin's caves of second hand goodies, with everything from quite decent second hand furniture to broken old bicycles and piles of out dated comic books. These are wonderful places to rummage, and every now and then it is possible to make a real find. Usually, as the name suggests, the items are shabby and a little broken, needing at the very least some TLC in order to regain past glories! It is also worth noting that Brocante shops very wildly from one to another, and local knowledge is the key to finding the best ones to visit. 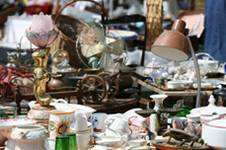 The famous flea markets of France are alive and well, and attract as much interest as they ever did. The king of them all, of course, is the massive "Les Puces" (The Fleas) in Paris, which covers seven hectares of prime Parisian land! If you can't make it to this one, however, don't despair, as there are smaller and less illustrious versions everywhere, frequently attached to the ordinary weekly markets and even to the summer night markets. Stall holders set up in a designated area and trading takes place as in any other market. There is usually a good mix of absolute rubbish to cheap and cheerful household items to second hand (and sometimes vintage) clothing and records. Flea markets are commonly advertised in the local press, posted on billboards around the towns and, increasingly, posted on the Internet. If your French is good you will also pick up information about flea markets from local radio. These are the closest relations to the British Car Boot Sales, and are incredibly popular all over France. The term literally means "loft emptying", and this is your chance to offload all that second hand rubbish that has been cluttering up your loft... or spare room... for as long as you can remember. It's too good to throw away, but you don't want it yourself... so take it to your local Vide Grenier! For weeks before a sale, signs begin to appear in the surrounding areas and villages, so that by the time the sale comes along everyone is primed and ready, whether buying or selling second hand items, or just along for a good day out. 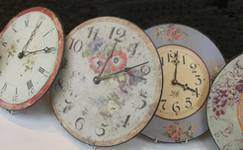 If you want to sell second hand goods at a Vide Grenier you need to pop along to the Mairie of the town or village that is holding the sale, and obtain the necessary permission from the Maire. There is usually a small fee payable. If you are buying, as with almost all second hand goods, it is a case of buyer beware! It is really up to you to decide if the goods are worth the price being asked and if they are genuinely as described. There is rarely any chance of comeback once purchased. One exception to the "buyer beware" rule is that of the Depot Vente in France. In a Depot Vente there are tight controls on the prices of second hand articles and a returns policy in place to protect the customer. It is usually possible in a Depot Vente to find all kinds of second hand goods, with furniture, bric a brac, clothes and even cars at times in these places. Some specialise in luxury and top end of the market items such as designer fashions and collector's items, whilst others have more in common with an Emmaüs sale or a Brocante. If you are selling items through a Depot Vente, you will receive the money raised for the item, less the commission paid to the Depot Vente. There are Depot Ventes all over France. Emmaüs is a charity in France that exists for a number of purposes, amongst which is to help provide employment for those who otherwise would have little hope. Its motto is to "Serve first those who suffer most", without any discrimination. It provides training schemes, health care, and work in many ways to alleviate the suffering caused by poverty in a positive and pro active way. One of the ways in which Emmaüs raises money for these causes, and also in which it provides employment, is to hold second hand goods sales in warehouses in the towns. These are held frequently, as often as every other week, and attract large numbers of people who can be found eagerly awaiting the opening of the doors at the allotted time. Prices are very low and everything and anything can be found on sale here, with art works jostling for space with cast off clothes, battered shoes and second hand furniture. Occasionally items appear to be almost new, and there can be some excellent bargains to be had... but you do have to get there for the opening or all the good stuff will have long gone. The people who attend these sales are very savvy and they know exactly where to look! When you find something you want to buy, you stand beside it and try to attract the attention of an assistant who will give you a ticket which you stick onto the item stating that it is now yours. For this reason it is good to attend these sales with a friend, so that one of you can "guard" the chosen item and the other can find an assistant! Small items can of course be carried to the desk for payment. Payment is made at a desk as you leave the sale rooms. If you wish to help a good cause and find that your move to France has left you with a lot of items you no longer have room for, then do consider donating them as second hand items to Emmaüs. It really is a good cause. Cars are something of an exception to the normal rule of good value, low prices and fun to buy in France. There is no escaping it... second hand cars are very much more expensive in France than the equivalent would be in Britain. It is, however, a thriving market, and a very popular way of advertising second hand cars for sale here is to simply park them up beside a main road with a placard in the window giving the details. Newsagents sell magazines advertising both new and second hand cars, and most large towns have car dealerships which may also have some second hand cars on offer. There are a few points to note if you are buying a second hand car in France. It is the responsibility of the seller to bring the Controle Technique up to date before the car is sold, so do make sure that this is done. You will need to inform the Mairie that you have a new vehicle, and fill in forms complete with the requisite fees (including a one off tax payment). All this is then sent to the Prefecture and finally you will receive your Carte Grise (registration papers). The traditional auction is still popular in France, particularly in the Art World. It is interesting, however, to see how popular Ebay has become in France in recent times, just as it has in the UK. Try it... it's addictive, good for finding second hand items and very good for your French! Second hand France - treasure trove or poubelle? So, second hand France is thriving. Auctions, sales and markets are a great way to furnish a home on a budget, and they also enable you to find second hand pieces which are sympathetic to the area in which you live. Vide Greniers are as much a source of entertainment as a place for serious buying and selling, and also provide you with an opportunity to meet and talk to local people. The French love a bargain... but sometimes they can hardly believe the things that the English buy. We often make a bee line for the items that they have thrown away, such as old kitchen cupboards with drop down drawers for baguettes and antique washstands. It just proves that what is a treasure trove to one man can be nothing but a "poubelle" (rubbish bin) to another... but therein lies the fun!